Now get them for under $8 each if you buy 3 units or more. 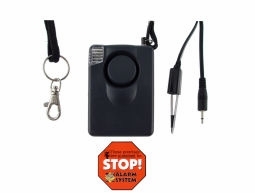 A very convenient, versatile personal alarm that can be used in a variety of ways with the loudest alarm in a portable unit. Excellent for traveling. 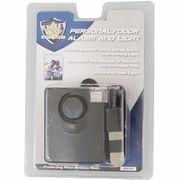 *The included door or window accessory can scare off an intruder and alert you to their attempted entry. *The unit can hang from the door to secure a hotel door or patient room door. Great travel security tool. ThisPersonal Alarm includes a built in flashlight and flasher. Also included is an alarm warning decal and complete instructions. When the alarm is triggered, the light also flashes. The light can also be used as a flashlight. Uses one 9 volt battery, not included. Dimensions: 2.25" wide, 2.75" tall, 1 3/8" deep. If ordered with the Alarm, you can get a Duracell Procell 9 volt battery, same as used in hospitals for only $1.99. Can be used to protect yourself, purse, laptop, luggage, backpack, etc.